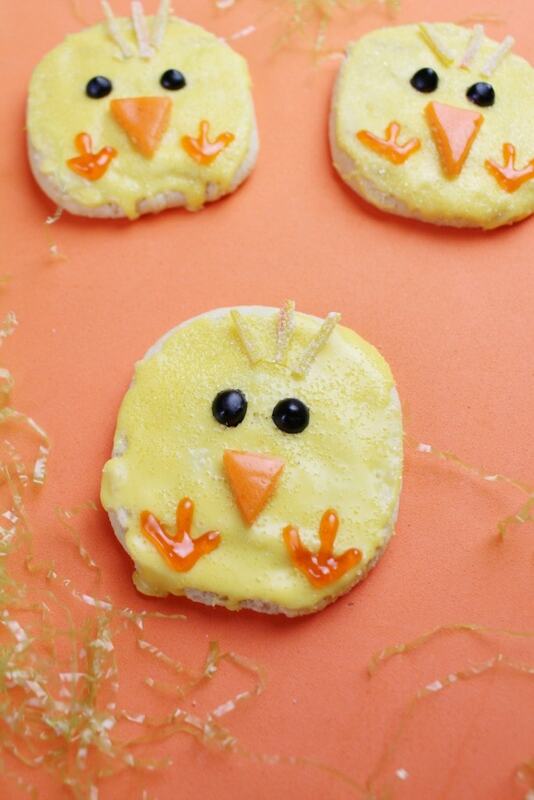 These Easter Chick Sugar Cookies are just too adorable and this homemade recipe is easy to follow. Give it a try and wow your little guests. 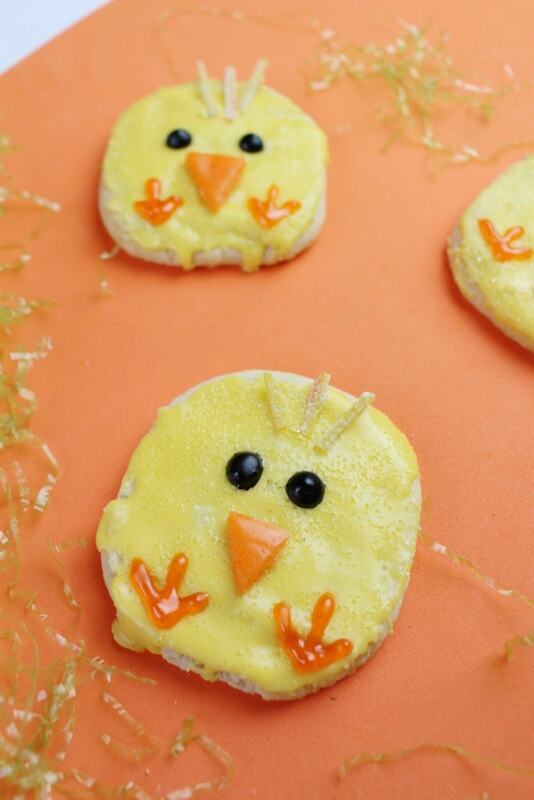 Everyone will enjoy these Easter chicks. In fact, the decoration is so simple, your kids can help out! More hands in the kitchen mean less work for you. Actually, that’s not true. We all know that. 2. Line cookie sheet with parchment paper and set aside. 4. In a large mixing bowl, add the butter and sugar. 5. Cream the butter and sugar on high for 4-5 minutes or until the mixture is light and fluffy. 6. With mixer on low speed, add the eggs and vanilla. Mix until well incorporated. 8. Add the remaining 1/4 cup sugar into a bowl. 12. Bake at 350 degrees for 10-12 minutes or until golden brown (oven temps vary). 13. Cool on baking sheet for 5 minutes. Transfer to wire racks to complete cooling process. 14. Line another baking sheet with parchment paper. Set aside. 15. Melt shortening in a double boiler. Add yellow chocolate melts and stir occasionally until completely melted. Remove from heat. 16. 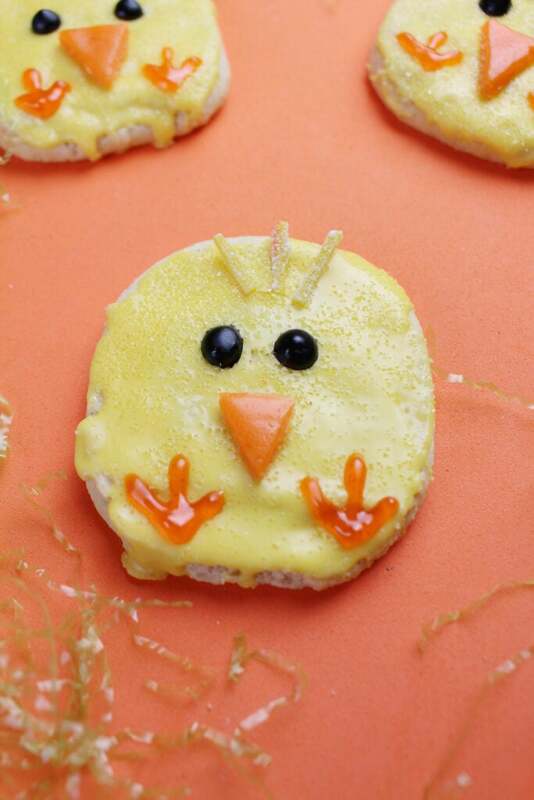 Frost each cooled sugar cookie with the melted yellow chocolate. I used a small metal spatula to spread the melted chocolate on each cookie. You need to work rather quickly as the chocolate hardens fast. Place the frosted cookies on the parchment-lined baking sheet. 17. Before the chocolate “sets,” sprinkle the sugared crystals on each cookie. 18. Cut away the yellow strip from each rainbow airhead extreme candy piece. Cut each long piece into 8 smaller strips for the hair of each chick. 19. Pipe 2 eyes on each cookie with the black icing. 20. Cut 8 small triangles from each orange airhead candy piece. 21. 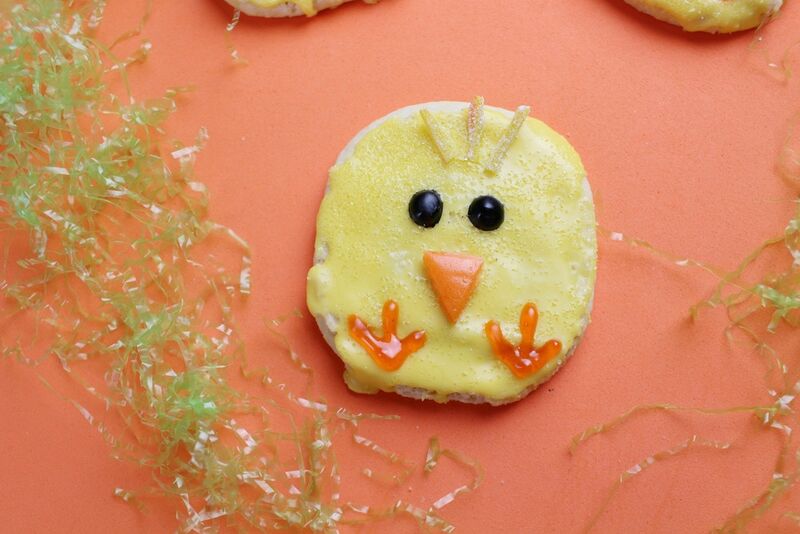 Apply small amount of icing to back of each triangle and attach to the cookie for the nose of each chick. 22. With the orange icing tube, pipe 2 feet at the bottom of each cookie.